Microsoft revealed how it plans to get Windows 10 into a billion devices within the next two to three years on stage at Computex 2015 by showing off nine new products from its hardware partners. Highlighting the diversity of the Windows ecosystem, these products range from all-in-one desktops, convertible and hybrid PCs, traditional notebooks with gorgeous designs, a portable desktop that turns your living room TV into a big screen PC and a pluggable PC that's as big as a wall charger. 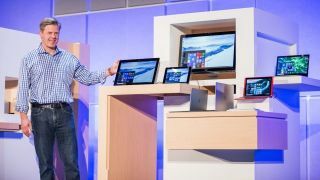 Nick Parker, corporate vice president of the OEM division at Microsoft, showed off devices from Acer, Asus, Dell, HP, Toshiba, Foxconn and Quanta. "Windows 10 will be available on July 29, and our partners will have devices that light up new Windows 10 features in market later this year," Microsoft said. The devices were used to show off some of the new and unique capabilities that Windows 10 will bring to consumers, including changes to the Start menu, universal apps, multitasking, switching between tablet and laptops on convertibles with Continuum, the new Microsoft Edge browser, and Windows security with Windows Hello. Acer has redesigned its Aspire Z3 all-in-one desktop. The new Acer Z3-710 shown on Microsoft's stage is a sleek device that looks like it has the body of Apple's iMac and the soul of Windows 10. It is just 1.4-inch (3.56cm) thin, has a gorgeous silver base and looks like it could have been designed by Jony Ive himself. Asus had two products on stage, a detachable 2-in-1 notebook and an all-in-one. The Transformer Book T100HA is a 10.1-inch 2-in-1 with a removable keyboard dock that promises up to 14 hours of battery life on a single charge thanks to the power efficient Intel Atom-based Cherry Trail processor. The tablet is only 0.33-inch (8.45mm) thin and weighs 1.28 pounds (580g) without the dock. The device also comes with a USB-C connector, like Apple's MacBook. The Zen AiO Z240 is an iMac challenger with its stunning design and fast performance, boasting a quad-core Intel Core i7 processor and Nvidia GTX960M GPU for gaming. It also features a 3D camera and a six-speaker sound system to satisfy your multimedia and entertainment needs. As a follow up to this year's gorgeous, five-star rated Dell XPS 13 Ultrabook, the larger Dell XPS 15 comes with the same carbon fiber and metal design, sleek nearly borderless infinity display screen, and a larger 15-inch form factor. Aside from its stunning good looks, users should expect a large screen to stay productive and entertained on the go, but with a more space-saving, compact design. HP has two tablets on deck for Windows 10. The first is the new HP x2, a detachable 2-in-1 that uses a simple magnetic connecting mechanism to join the keyboard dock and tablet together. The magnets eliminates complicated latches and makes it easier to convert between the two form factors. Microsoft has used magnets before on its tablets, including the Surface 3 and Surface Pro 3. The slate comes with Bang & Olufsen's B&O sound experience. We don't know much about the second device from Hp, except that it is a mobile productivity tablet. Given its focus on note taking, we expect a digital stylus, though it's unclear what pen-enabled technology HP will utilize in that device. Microsoft says that the slate features "revolutionary note-taking capabilities" in a statement. From the description it appears that Toshiba has an all-in-one desktop that supports Windows Hello. The device comes with "the latest in biometric security, including a face-authentication camera," 4K UHD display and enhancements to make Cortana work even better. We're not sure what optimizations Toshiba did, but given Cortana's speech and natural language understanding, we would wager that the company added more microphones and perhaps even a noise canceling microphone for better speech recognition. The Foxconn Kangaroo is an interesting ultra-portable PC with a six-hour battery life that comes with a fingerprint reader that works with Windows Hello. Think of it like an Ultrabook, but without the screen. Similar to other mini PCs on the market – like Apple's Mac Mini – users will have to bring their own keyboard, mouse and screen. We imagine this to be an excellent solution for road warriors who have to give presentations in the board room as the device can easily connect to a projector or UHD display. The added fingerprint security and Windows Hello support should put IT departments at ease given the portable nature of this PC. The Quanta Compute Plug is a super miniaturized PC that's as big as a standard wall charger. It comes with several USB plugs and and an HDMI connector to connect to a display or your living room TV. Bluetooth connectivity allows users to connect a keyboard, mouse or remote to control the Compute Plug, or use their Voice thanks to Cortana integration in Windows 10. The idea is not unlike Intel's Compute Stick. Microsoft used its Computex keynote to highlight the features of Windows 10 and the diversity of form factors the operating system enables. As such, the Windows-maker did not reveal hardware specifications for the system nor did it disclose pricing or availability. We know that Windows 10 will be arriving for consumers starting on July 29, so these systems should arrive on or after that date given they ship with Microsoft's latest OS. In addition to the devices on Microsoft's Computex stage, Lenovo, Acer, Dell and Asus announced a broader portfolio of PC products at Computex.